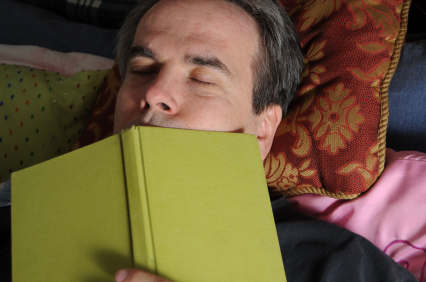 Do you fall asleep when you are reading? Some people seem to fall asleep as soon as they start reading, especially if they are sitting somewhere comfortable, and almost always if they are reading in bed. The falling-asleep-or-not response does not seem to have to do with content. I can stay awake reading books that are so boring they might as well be instruction manuals on how to watch paint dry. And those people who nod off as soon as they’ve opened their books often actually really do want to find out what happens next but, page-turner or not, they just can’t help themselves. I do not believe this is a gender issue (despite the fact that I have known more men who fell asleep while reading than women, and despite the images I’ve chosen for this article). One of my dearest friends (love ya, Bonnie) wears old glasses that have an arm missing to read in bed because she knows that she’s going to end up sleeping on them anyway. I also don’t think that those who nod off are more tired than those who don’t. No matter how tired I am, I don’t think I have EVER fallen asleep with a book open in front of me. Maybe the same people who fall asleep over books also fall asleep in movies. I wonder if any readers who fall asleep over books are also writers, and if those people also fall asleep while proof-reading their own stuff. Does anyone out there know anything about this? My human behavior guru, Jerome Kagan would say the difference is powered by curiousity and the need to know, which he says is a way to conquer uncertainty. He thinks uncertainty can be almost as motivating as hunger. I will not take on some books because I get strongly caught in this need. If it is a six hundred page tome with a good plot line I could lose a whole weekend. Not good when you are 76 and trying to work through a long bucket list — mainly finishing writing all the books in my head. I wonder if there are people who fall asleep over some books and not others. Maybe it’s not an all-or-nothing situation. I am an avid bookworm but I fall asleep all the time while reading, even on a sunny afternoon outside. It’s kind of frustrating. I’d like to not do that, but it’s not easy. 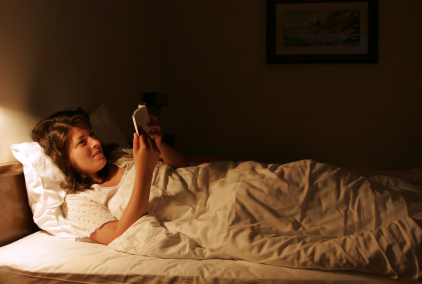 Perhaps it’s a learned behaviour – reading just before going to sleep? That being said – I find I have a great sleep when I’ve been reading the night before. I feel more relaxed, my brain seems quieter, my dreams richer. Perhaps reading is a calming, relaxing experience – and hence, ushers in the next step: sleeping. I’m actually envious of what you have described. Ask your son the scientist, he should know. I was thinking I should do that, Michael! He’s in Japan this week and then Edmonton, but when he returns I’ll suggest it as a segment on his show. :) For those wanting to use my method- the arm snapped off when I rolled over the glasses in my sleep-and voila! I have to read every night and if I don’t I have to create a story in my head that has nothing to do with my real life otherwise I will lie awake all night. I have long felt guilty about falling asleep while reading during the day and try hard not to do that but if I want a really good nap…. I’ve thought about why it happens but the most I can come up with is that it begins with my eyes stinging and I have to close them but I want to continue reading so then I imagine what might come next in the story and then the alarm clock rings. I think I agree with the conditioning originating from childhood. The study, if done, should also include the bedtime story tradition and what role it has played. I always read in bed until I fall asleep. My wife can tell how much I’m enjoying a book by the length of time that elapses between the book opening and the book falling forward on my face. Okay. So this shows that whether the writing is compelling or not has an effect for some people. It doesn’t seem to for me. Excellent point, Marion! Some of the people I’ve known who nod off DO have sleep apnea. As usual, good subject material, Mary. I was in my early forties when I started falling asleep while reading. Made no difference what I was reading or where I was reading, I’d simply lose focus and drift off. I attributed the “impairment” to aging and, because several contemporaries confessed to the same condition, resigned myself to live with it. But once I dedicated myself to writing—at least half of which is reading—I had to fight back. By trial and error, a partial victory was achieved by paying closer attention to light sources and comfort levels. My designated reading spot was inviting but not too inviting; my reading lamp produced daylight levels without glare. Reading in bed was out of the question because the brain associated bed with sleep. Eventually I learned from an ophthalmologist that every eye has a certain amount of difficulty adjusting to contrasts—black print on white page, say—and the brain behind all this adjusting eventually flips the sleep switch. This form of strain is more pronounced in some than others, and is neither gender nor age specific. Supporting that assertion, my somewhat aged spouse reads 2-3 books a week without nodding off and my college student granddaughter sets an alarm to go off at 15-minute intervals in order to get through a night of heavy reading. I understand studies have been done that expand on the “contrasts” theory and emphasize the importance of proper lighting. From what I have learned so far, I’ll fearlessly say it’s a neurological problem. Wow! Thank you, Mary! A treasure trove of info here. Thanks for the offer to send me a review copy, Mary. Alas, I must refuse. Reason? I ordered a copy and will have it on Friday. And I’m very much looking forward to reading it… wide awake. I used to be able to read into the wee hours. But now, if I try to read in bed I always fall asleep – same goes for just laying on the couch reading at night. During the day, I don’t seem to have this problem unless I am surrounded by sleeping cats. :) I think it is because the 9-5 job has not only sapped my energy, but has also trained me that if I am not sleeping by 11pm, I am in for a rough day the next day at work. Without fail. I have nearly injured myself dropping books and my kindle on my lips. I haven’ fallen asleep as yet proofreading one of my stories, though have come very close. I do occasionally nod off while reading in bed especially if the day was particularly taxing. Never thought of that, but it sounds right. Also, the more dense it is…. “Breaking up the prose with racy dialogue will keep your readers awake,” said Alice. I know this is two years old, but it was “recommended” when I was told you liked my Iceland photos and it intrigued me. I’m the “I-have-to-force-myself-to-stop-reading” type. With one exception: when my daughter was young, I would fall asleep reading to her. I know someone who falls asleep as soon as the priest starts preaching–as if she has programmed herself to do so. Is that neurological or behavior modification? Does one fall asleep because one expects to . . . hmmmm.